Noise is often described as being ‘unwanted sound’. In many circumstances noise problems can be resolved by talking things through informally with the alleged noise maker. However, informal approaches do not always work and this is where Environmental Health Officers can help. The Environmental Health Department can investigate noises complaints under the Clean Neighbourhoods and Environment Act (NI) 2011. Officers can investigate noise complaints from domestic, commercial and industrial sources. After making a complaint either through the Noise App (see below) or by telephone your complaint will be allocated to an Investigating Officer. You will be required to record details of the type of noise, the dates and times it has occurred and the effect that the noise has had on you and/or your family. This is most easily recorded through the Noise App. Should you prefer to keep a paper diary then noise log sheets for you to complete for a period of 2-3 weeks can be posted to you. The alleged noise maker will receive a letter at this time advising them that a complaint has been received. After a period of 2-3 weeks your electronic diary via the Noise App, or your paper copy of noise log sheets (once returned), will be reviewed by the Investigating Officer. Arrangements will then be made to monitor the noise, through either continued use of the Noise App, in person or using noise monitoring equipment. Whether further action is taken is dependent on the observations made during the monitoring period. If the Officer is of the opinion that a ‘statutory nuisance’ exists, a Noise Abatement Notice shall be served on the person responsible for the noise. They will be legally obliged to stop the nuisance. There is a 21 day period during which an appeal can be lodged against the Notice. Failure to comply with the Notice is an offence. This could lead to prosecution and a fine of up to £5000 with a further fine of up to £50 per day for each day the offence continues after conviction. The noise app can be used to record noise nuisance every time there is a problem. This helps us to tackle the problem particularly if we need the evidence to go to court, but it is also very useful to help us show neighbours how they are causing people a problem. This is normally all we need to do to address the problem. The other thing the noise app can do is allow you to record problems as they happen and helps to create your diary sheets. We can then look at the records you have made without you having to send them to us by accessing a secure website. To download the app go to the 'App Store' for iPhone users or the 'Play Store' for Android users. 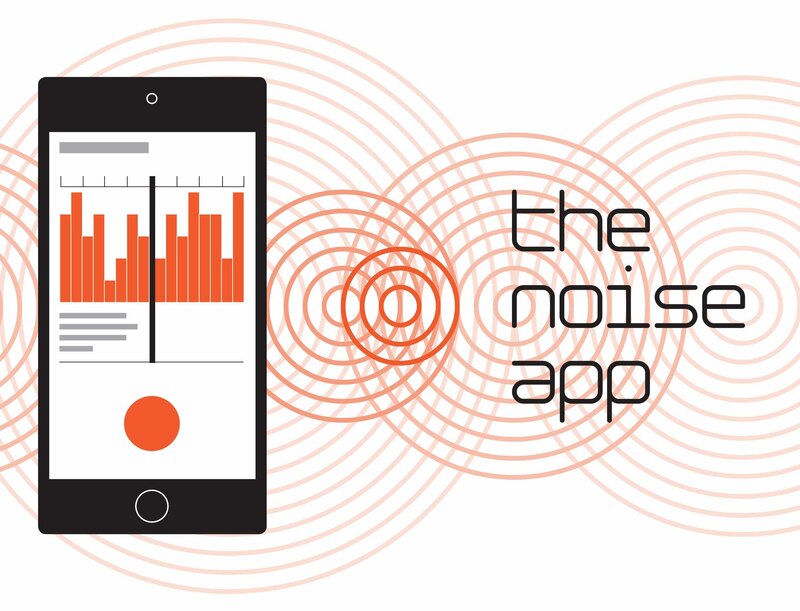 Search for 'The Noise App' and click 'Get' or 'Install' to download the app. Open the app and click on Create an Account. Fill in the details and select Mid and East Antrim. Agree to the terms of service and click Create Account. An email will be sent to your email address asking you to confirm your account. Once your account has been confirmed log in to the app on your phone. This will prompt you to enter your address and complete the registration process. Once your account has been confirmed you can then begin submitting recordings. After logging in for the first time you will be prompted to make a recording. To start recording press and hold the microphone icon button at the bottom of the screen. You don’t have to record the whole event, just a representative snapshot of the noise as it is happening. You can record up to 30 seconds and if you need to, you can make several recordings each one 30 seconds. Whilst recording you will see a wave form along with a timer that moves across the screen. When you remove your finger or thumb the app stops recording. You can then accept, reject or playback the recording. Once accepted, you will then be prompted to provide more general information about the noise you are experiencing. Next, where did you record the noise? Choose an area of your property from the list provided and move to the next screen. You are then asked to rate the noise in terms of how loud you consider it is. Underneath you may add a comment as to how the noise is affecting you, for example, you might state “the noise woke me up and is preventing me from getting back to sleep”. This information about how the noise affects you is very important so please try to add as much information as possible. Lastly, enter the address of the noise source. Please ensure you check the address is correct if you use the Google maps GPS function. If you are happy with the information presented on the confirmation screen press the 'send report button'. Your recording will then be placed into your diary. This may then be reviewed by your service provider. You’ll receive a confirmation message saying that your entry has been sent. Your first entry will populate your noise diary and will appear at the top of the screen with all your previous recordings listed below. The symbols on the left change colour according to whether your entry has been reviewed by you, us or not viewed. When you next log on you will be taken to your noise diary. Continue to make recordings and entries for as long as the problem continues. Select any entry in the diary and you will access two screens: 'detail' and 'activity'. You can switch between the detail and activity screens using the tabs at the top. The detail screen (on the left) provides a summary of the information relating to the particular diary entry you selected. In the activity screen you will see a summary of activity related to that entry by you and the investigating officer. You can also add text using the comments box at the bottom. This is useful for adding additional information after the event, for example, how long the noise continued for. We have been informed that some users are currently experiencing some syncing issues on Apple devices. When a user tries to submit a report but loses signal or closes the app too early it can create a blockage where further reports will not upload. The user will see the message "Tap to Sync X Recordings". To fix this issue please follow the below instructions. We are currently working on a permanent fix for the issue in our next App Store update but this will not affect all users.